THIS round’s Team of the Week is evenly spread out, with no team having more than two representatives in the best 22. After their disappointing losses on the weekend, Williamstown and the Western Bulldogs are the only two teams to only have one player represented. Every other team has two players who made the cut in a week with many solid performances. Eden Zanker had a breakout game for Casey up forward in its win against Carlton. She kicked three goals and had a real presence up forward all game. Anne Hatchard was also superb up forward for the Northern Territory, kicking four goals from 15 disposals in its big win over Williamstown. These two were locks in the Team of the Week after their stellar performances. In the midfield, Alison Brown dominated for the Saints with 28 disposals. As well as Brown, the Thunder’s Emma Swanson was also a lock in this week’s midfield as she kicked one goal from 27 disposals. In the back line, Hawthorn’s Jayde Van Dyk and Richmond’s Jacqueline Graham once again held their spots after 18 and 20 disposals each, respectively. Tanya Hetherington from Essendon and Iilish Ross from Collingwood both managed to get forward and kick goals from the back line as well as racking up a number of disposals each. The back line was easy picking this week with performances like these. 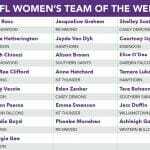 Jess Sedunary can count herself as unlucky not to be in the best 22 this week after a really good game for NT on the weekend. She kicked 21 disposals from the half forward flank and also managed to kick a goal in a really positive performance. Jenna Bruton is also in the same position, as Bruton and Jess Duffin were fighting for the same spot and Bruton unluckily missed out. She lit up the midfield for the Seagulls with 22 disposals in a losing effort to the Thunder. WITH only a month remaining in the home and away season; the competition heats up as teams battle for top four positions and a finals berth. Collingwood, Hawthorn and the NT Thunder appear to have separated themselves from the pack as they sit comfortably in the top three, while Geelong will have a number of teams chasing them for the final position as we head into September action. A very important round of footy ahead. Despite not registering a win last week, the Demons were extremely impressive against the Thunder, almost pulling off a monumental upset in Darwin. After trailing by 42 points at half-time, the Demons held the Thunder to just three behinds after half-time as well as piling on five goals of their own to create an intriguing final minutes before ultimately falling just short. One of the keys for Melbourne’s AFLW campaign this past summer was Shelley Scott, and she improved how important she was when she made her Victorian Football League (VFL) Women’s debut last week and turned out an impressive 15 touches to go along with two goals. Star Demon, Bianca Jakobsson will also be pivotal in this clash as she continues to be in spectacular form. Carlton continued its mini resurgence with its second win from three games in a dominant performance over the Tigers. The leading goal kicker in the competition, Darcy Vescio extended her lead with another two goal performance. She was assisted by captain, Kristi Harvey’s two goals as she continues to look damaging. A strong game from defender, Gabriella Pound was also exciting as she had a game-high 27 possessions. Although finals are very unlikely for the Blues, they have shown over the past month that their best footy can match it with anyone. Williamstown sit only percentage from last-placed Essendon, having registered only one win through the first 10 games. The Seagulls take on an in-form Thunder side, who have routinely recorded big victories over lower-placed teams. Williamstown has had a number of standout individual performances this season, most notably by Jess Duffin who has been unbelievable week in and week out, as well as Jenna Bruton who has really hit her stride of late. But the team is yet to put together an all-round performance, and this will be a key in staying competitive against the Thunder, who have been known for having a number of different contributors and consistent performers each week. The Thunder as mentioned came out of the blocks on fire against the Demons last week and looked to be on their way to another big victory. They did stagnate in the second half however, only kicking the three behinds, which will be a concern heading into this contest. Another fast start will be crucial as the longer the Seagulls are able to compete with the juggernaut Thunder, the more belief they will get. Angela Foley and Emma Swanson will be key through the middle of the ground this week, especially with Jenna McCormick set to miss the game through injury. After the men face off at the MCG on Friday night, Geelong’s VFLW side plays host to Richmond at GMHBA stadium. With several teams gunning for the Cats’ position on the ladder, they will need to come out focused and ready in a game they should be able to take care of business and continue to push towards September. After a poor month of footy in June where Geelong lost its only two games for the season, the side has been able to bounce back nicely and return to their form from early season. This has coincided with the return of Richelle Cranston, with the new recruit putting together an unbelievable season for the Cats. Richmond continues to be disappointing in its campaign, with yet another blowout loss last week at the hands of Carlton. The biggest issue for the Tigers has been the play of their forward line, as they’ve struggled to kick big scores all year. To make matters worse, their number one target up forward, Courtney Wakefield will miss the game with injury. 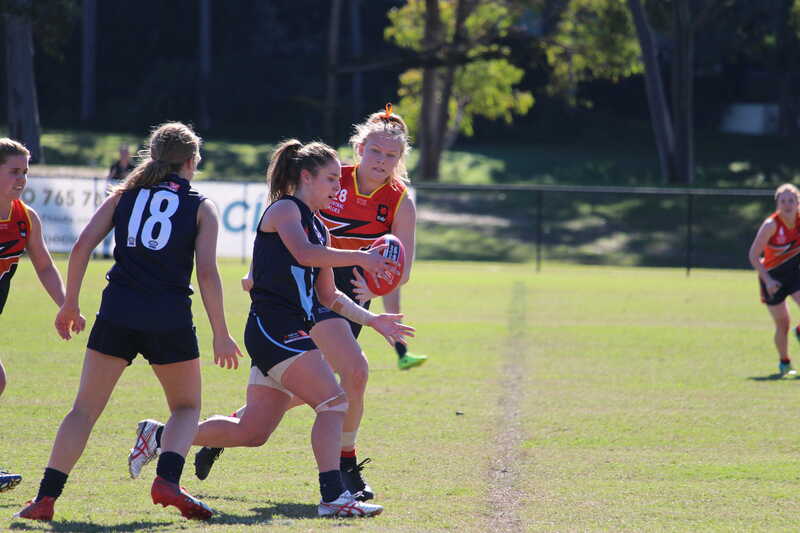 Phoebe Monahan continues to do it all for the Tigers, getting plenty of the ball through the midfield with 20 possessions last week, and helping register the team’s only goal against the Blues. In order to beat Geelong, they’ll need strong performances across the board, however the forward line will be particularly crucial, given the quick scoring ability of the Cats. Darebin come into the game with six wins and four losses from its 10 encounters and sit just a game and half behind Geelong for fourth place on the ladder. The Falcons take on the third-place Hawks, who continue to play terrific football. The game presents the Falcons an opportunity to truly announce themselves as a contender as well as help close the gap between them and the other top four sides. Lauren Pearce has been fantastic for them in the ruck, setting up their midfield for plenty of clearances in recent weeks, including her AFLW teammate, Elise O’Dea, whose return has been enormous for Darebin. The Hawks sit in third place on the ladder with only percentage separating themselves and the Thunder, whom they have a game in hand on. As mentioned last week, the Hawks have perhaps the toughest run home of all the teams in the competition and this week will be no different. They come into the game off of a strong last quarter against the Saints, coming back from a goal down at three quarter time to run out nine-point winners. Sarah Perkins returned back into some form last week with a strong game, although she will be hoping for a more accurate day in front of goal, having kicked just one goal to go along with three behinds last week. The Bulldogs remain the hottest team in the competition, having won their past six encounters. The win streak has put the Dogs right back into contention for a finals berth, with just a game and a half separating them from Geelong. 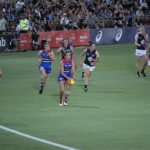 Ellie Blackburn has returned to the line-up in recent weeks and has been in as good of form as she was over the summer in the AFLW season, as well as several other premiership teammates returning to their best. They’ll have to look for their seventh win in a row without her, and continue to offset their poor start which saw them lose their first four games; something which may come back to haunt them. The Saints will be disappointed they let one slip away last week in their battle against Hawthorn. Leading by four points at three quarter time, the Saints only managed to register four behinds in the last quarter to the Hawks’ three goals, as they ultimately fell victim to a nine-point defeat. The loss puts them at four wins and six losses from 10 games and with finals now unlikely, they must focus on finishing strong and building for season 2019. One of the best rivalries in all of football is renewed on Sunday afternoon when Essendon and Collingwood meet in the final game of the round. It is a battle between two teams on the opposite ends of the table as the Pies sit atop the ladder, whilst the Bombers sit at the bottom of the table. Despite just the one win, the past month has been a positive one for Essendon, as the Bombers were able to register their inaugural VFLW victory and have remained competitive in recent games. The midfield duo of Maddy Collier and Hayley Bullas has been very beneficial for the Bombers, and have given the team the belief that they can pull off a victory. Collingwood registered another impressive win last week; topping Melbourne Uni by 19 points. Chloe Molloy starred once again with 23 possessions and her usual efficiency, however she will miss the game this week in what could play a huge factor. 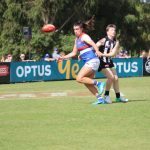 The Pies were bolstered last week by the return of Steph Chiocci who played her first game of football since Round 4 of the AFLW season, where she missed the last three games due to suspension and an early season injury setback which forced her to miss the first nine games of the VFLW season. The Magpies forward line will be a challenge for the Bombers, as it has been for most teams all year. Sophie Alexander continues to put up great numbers each week and has been hitting the scoreboard consistently. IN this week’s edition of number crunching, we look into the best performances from AFLW players in the Victorian Football League (VFL) Women’s 2018 season. Due to so many teams being shuffled around from what they were back in 2017, this season has shown how players can adapt in weaker and stronger teams. In no particular order, here is the best 10 AFLW players in the VFLW. Williamstown’s Jess Duffin played for Collingwood in the AFLW in 2018 and will play for North Melbourne in 2019. She has had a fantastic season so far in Seagulls colours, playing nine games. Duffin has kicked eight goals and has constantly been chosen as one of the best on ground for her games. Her disposals and mark stats are always high, and that’s something that deserves to be seen in the next AFLW season. Following Duffin is Collingwood star, Chloe Molloy. 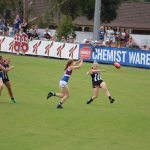 Though only a first year player in the 2018 AFLW season, the 19 year-old has made a name for herself with her athleticism and style of play. With only playing six games so far, Molloy has been quieter than expected but has made an impact despite this. Molloy is still a young player, so it’s exciting to see her progress. The next and final Collingwood player in the top 10 is Jamiee Lambert. Lambert has had a brilliant season for Collingwood, kicking six goals in the eight games she has played. The midfielder is a near shoo-in for the Best and Fairest due to her experience leading to her strong performances. Despite being sometimes overlooked during the AFLW, Lambert shouldn’t be this season. Richelle Cranston, current Geelong player and former Demons player, has been strong in the Cats midfield. With playing nine games and ranking in the top six in eight of those games, it’s clear that the coaches see how Cranston is a force on the field. Cranston has led the competition for inside 50s and continues to have high stat numbers in disposals. 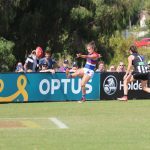 Reigning AFLW Best and Fairest winner and Bulldogs premiership player, Emma Kearney has picked up where she left off in the AFLW, dominating for Melbourne Uni in the VFLW. Kearney, who recently transferred to North Melbourne, has only played six games for Melbourne Uni this season but has still been strong as their centre. The midfielder has frequently displayed her strong style of play for Melbourne Uni and will continue to show that as the season wraps up. Following Kearney is Carlton superstar, Darcy Vesico. Vescio is always a prominent face in the AFLW and VFLW, and for good reason. Even though she has played six games this season, Vesico has kicked 15 goals, making her second ranked in the league for goals kicked. The key forward also has one of the highest goal averages in the league, with 2.50 goals per game. Nat Exon has proven to be an elite player for both Darebin and the Brisbane Lions. 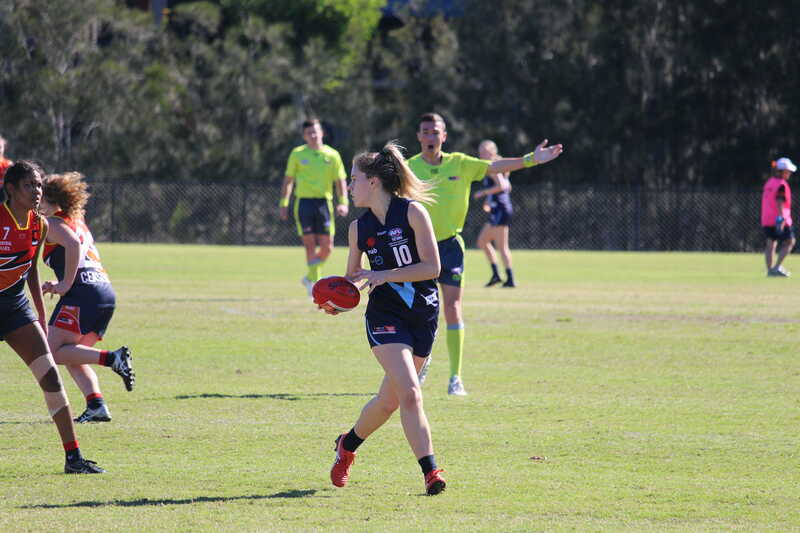 Exon has had a great season and is one of the top Best and Fairest prospects for the league, with ranking in the top six for her team in six out of her seven games played. 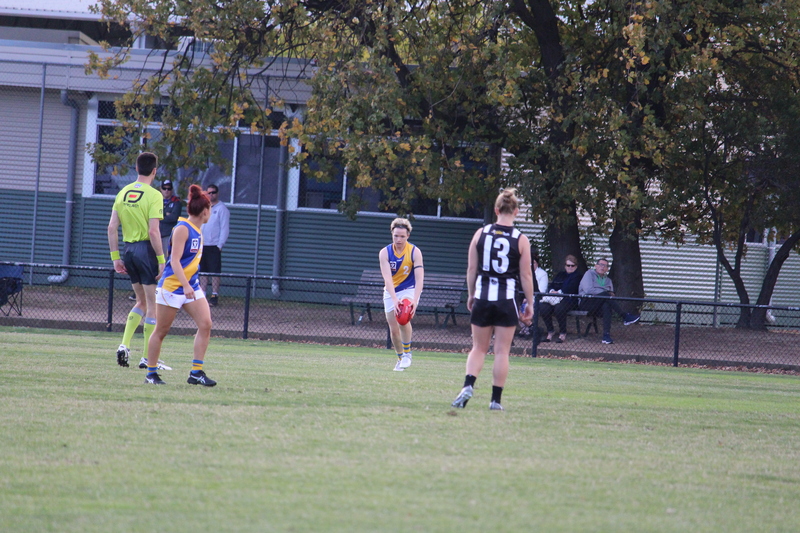 Exon has continuously performed with an unrivaled persistence, proving her necessity in the midfield for Darebin. 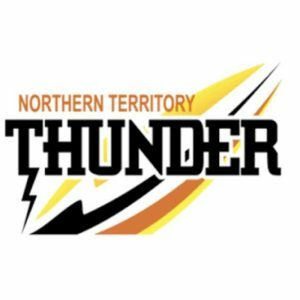 NT Thunder has had a historical debut in the VFLW, currently sitting second on the ladder. It would be unfair to not acknowledge the amazing players like Jessica Sedunary who have put them there. Sedunary, who also plays for the Crows, has had an unbelievable VFLW debut herself, kicking 14 goals in her eight games for NT. She is the third highest goal kicker in the league and has been a key factor in NT’s success. Another key player for NT has been their captain, Angela Foley. The versatile Adelaide midfielder/defender has been a notable leader for the young Thunder side, kicking seven goals in the nine games she has played for the Thunder. Foley has been a real link in NT’s midfield, allowing her teammates to have a very fluid style of play this season. Her position as in the middle has allowed her to dominate the field for her team. The final player for this list is NT and Greater Western Sydney’s (GWS) Emma Swanson. Swanson is NT’s fourth highest goal scorer with nine goals in her nine games, leaving her with a nice 1.1 average. The GWS marquee star has been an important player for NT, usually playing in the forward line. Swanson’s dynamic style of play has led to her being an important player for NT, placing her as one of their best players in a team full of weapons.